In this Aug. 2, 2018 photo provided by Dawn Manteufel, Greg Manteufel lays in his hospital bed at Froedtert Hospital in Milwaukee. Surgeons have had to amputate his legs and hands after he contracted a rare blood infection from a dog lick. Froedtert and the Medical College of Wisconsin infectious disease specialist Dr. Silvia Munoz-Price says the infection caused Manteufel's blood pressure to drop and circulation in his limbs to decrease rapidly. Munoz-Price says the infection is rare, adding that 99 percent of people with dogs will never contract the bacteria. A Wisconsin man had part of his arms and legs amputated after a medical emergency caused by a bacteria found in dog and cat saliva. Greg Manteufel began feeling ill in late June and within hours went into septic shock, according to a GoFundMe account created to raise money to help the family through his recovery. He was admitted to the hospital, where doctors said Manteufel had contracted an infection caused by bacteria commonly found in the mouths of dogs and cats, called Capnocytophaga canimorsus. His wife, Dawn Manteufel, told a local news station her motorcycling-riding, loving 48-year-old husband had been around dogs his entire life, but that doctors suspect a lick may have caused the infection. 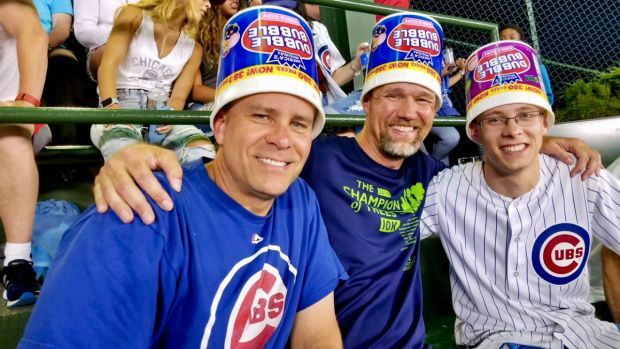 A pin from the centerfield scoreboard at Wrigley Field fell on a Cubs fan in the stands. Kyle McAleer speaks out about the incident that opened a two-inch gash on his head. NBC 5's Patrick Fazio reports. Though the bacteria is most often transmitted to humans through dog bites, the US National Library of Medicine at the National Institutes of Health reported rare cases where scratches, licking or other contact with dogs or cats transmitted it. The bacteria seeped into Manteufel's bloodstream and caused sepsis, or blood poisoning from the infection, and within days of being admitted to the hospital, doctors were forced to amputate both of his feet, the GoFundMe page details. A second surgery removed more of Manteufel’s legs, up to his kneecaps. He then later lost both of his hands up to his mid-forearm. Manteufel will need several more surgeries, but family members reported he was "so thankful to be alive today and is taking one day at a time." The GoFundMe page for the Manteufel family has raised over $67,000 of its $100,000 goal as of Thursday morning. It notes that the recovery will be a long process, including months of surgeries and the need for prosthetics. The Centers for Disease Control and Prevention notes adults 40 years old and older are more likely to contract an infection, and risk factors include alcoholism and weak immune system related to cancer, HIV and diabetes. Another key risk factor is not having a spleen. The agency also reported that Capnocytophaga can cause serious illness in pregnant women and their fetuses. Infection during the last few weeks of gestation can lead to inflammation of the membranes surrounding the fetus, and sepsis, a bacterial infection in the bloodstream or body tissues, in the newborn. It has also been linked to low birth weight. Capnocytophaga infections are rare, and doctors told Dawn Manteufel her husband's case is a "crazy fluke," The Washington Post reported.